The savings were boosted by £20.14 from InboxPounds*, £10.24 from ebay sales and £50 rent received. Usually, it’s £200 rent that I put into my savings, but I’ve decided to put the rest towards my mortgage – not sure if I’ll continue to do it over the next 12 months yet though. Yippee – 50% again but it only takes my running average for the year up to 43.86% – I was severely let down by my mad July! Never mind! The way I’ve displayed my portfolio is different to how I’ve done it in the past. Basically, I’ve rolled my SIPP, ISA and other investments all into one ‘portfolio’ (since I’m aiming for my ‘Portfolio For All Seasons‘) – just easier for me to track on here, although of course, off line, I track them separately for tax reasons. Anyway, I’ve hit a bit of a personal milestone, in that my investments have gone over the £20k mark, sitting at £20,758.40 today! My goal for 2014 is to have investments worth £22k, so I’m still on track for that. (e) This value no longer includes the money to be used to pay off my car loan. 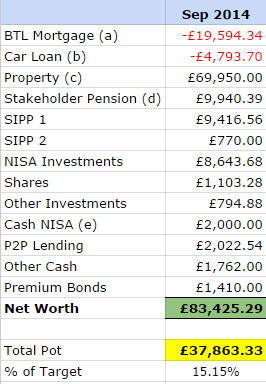 My net worth has increased by £2,305.13 since my last update in June. This is despite removing the funds (around £2.1k) earmarked to pay off my car loan, which had been sitting in my cash ISA. These funds have now been shifted to my ’emergency funds’ pot, not to be included with my investment and savings tracking. 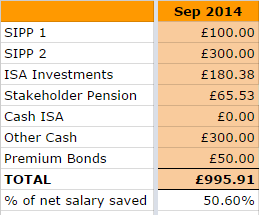 Anyway, my assets (not including property) now total £37,863.33, which is 15.15% of my ultimate goal. It’s all heading in the right direction slowly – must think of tortoise versus hare to keep myself focused! This entry was posted in Funds, Net Worth, Portfolio, Savings by weenie. Bookmark the permalink. Is there a good reason why you don't focus more on paying down that car loan in the short term? I might be wrong but I suspect you're paying quite hefty interest rates on it so would benefit by reducing your saving/investing and see it off over 3-4 months? Hi UTMT, the car loan is a fixed interest one (under 6% APR, don't have the exact number to hand) and there is no reduction or benefit if I settle it early. I could probably negotiate to pay larger instalments so that I finish paying it off sooner, but the total I will pay will remain the same, so I'm comfortable with how it is. I may end up paying it off a couple of months early, we'll see. Thanks for stopping by! Great job saving 50% this month and congrats for reaching the £20K mark! Hopefully you figure out a way to boost your savings rate over the next three months to hit your target goal for this year. Hi NMW, thanks and yes, I'm looking at ways to cut back on things – most of my spending will be on Christmas gifts and also my air ticket for my trip to HK in December. But I'm going to keep at it, get as close to 50% as I can and then try to beat that next year! Mentally, I've made a note to shop for any clothes or shoes in the remaining months of the year. I'm seriously considering extending it for the whole of 2015 but need to think about how that will work! Good job on the net worth and savings rate! Hi M, thanks and thanks for stopping by! Wow! Half of your income saved is an amazing feat! Congrats. Keep those debt payments coming in and continue to invest in dividend paying stocks and create that ever growing passive income stream. Look forward to your next update. Congrats on yet another 50% saving month, an annual average of 44% is close too. If you don't manage to achieve your goal of 50%, you shouldn't be far away. Well done on the surpassing your milestone! £20k is quite an achievement. It looks like your £22k goal for the year is in sight now and the amount you've been saving each month should result in you passing it by the year end. It's great to see it all coming together for you. Slow and steady wins the race. Keep up the good work and thank you for sharing your success! Hi DivHut, thanks! I've only been able to do this since starting this blog, it's a little easier to stay on track with savings and investments when you have a plan and goals in place. There's still room for improvement, so I'll be seeing what I can do next year. Thanks for stopping by! Hey Huw, thanks! 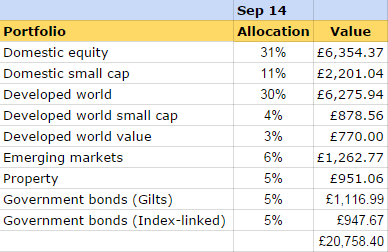 2014 won't be a complete year for me investments/savings-wise since I only started partway through the year, so I was being ambitious with that 50% target, but like you say, 44% is still pretty good. Am really pleased with the milestone and yes, slow and steady is how I need to be! Thanks for the kind comments and support! Thanks Cerridwen! At the moment, I've set it up so that I will save a minimum of around 30% of my net income every month – money gets transferred into my investment and savings accounts as soon as I'm paid! The other 20%, I then try to make up with the rest of my income, not always successfully! I'm glad I'm able to inspire you and hope that you spot some savings that you can make! Thanks Laura and yes, it certainly does! 50% saving rate is awesome. Looks like you're making great progress. Congrats! Thanks Tawcan! I have made a lot of progress, especially compared to where I was last year – long may it continue! Thanks for stopping by!